There is a connection to God that I feel strongly when I am creating with my hands. 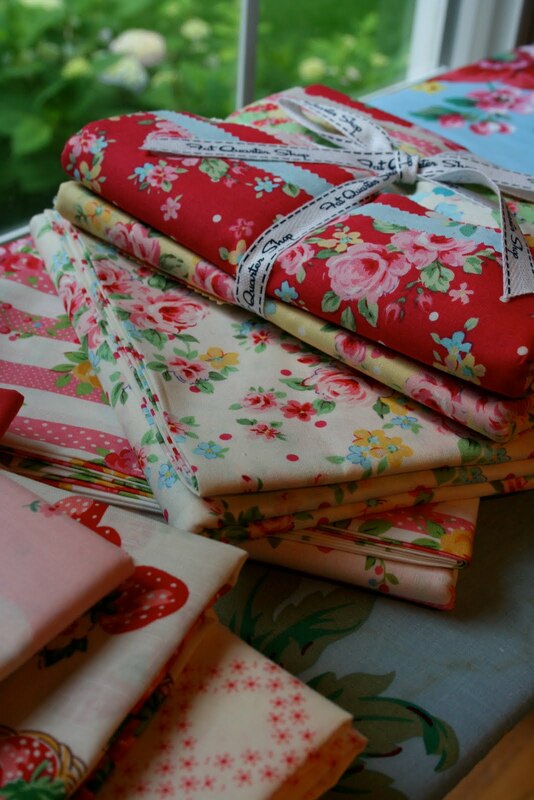 For me, seeing the perfect rose floral fabric can almost bring on a physical reaction. While this may sound odd to many of you who do not sew or craft, for those of us who do it is very much our reality. If you were to examine your heart, you would find the thing that you most enjoy. There is something that makes your soul sing, your God-given talent. Once you tap into it, you will feel most content and at peace when you are doing it. It may not be just one thing, but I have no doubt you will know it when you do it. This morning I found my daughter in my bed. After a rough night's sleep she decided that being under my quilt was the place she would find comfort, safety and peace. This reconfirmed to me that as I allow God to establish the work of my hands, daily, that quilting is one of my strong connections to God and people. Beautifully said Renee.Have a blessed contented day! Annie, I would love to comment on your blog but I can't figure out how! Let me know. Thank you for your kind words! Such a lovely post! Thank you for sharing. Your fabric is absolutely beautiful! But even more beautiful is the connection you have with Christ through your quilting. Nothing blesses a momma's heart more, than knowing we can bring comfort to our children. :o) Your picture is precious! Stopping by from Tuesdays Unwrapped. Love this post! Love the fabric and quilt! My mom just pieced a major project of mine, and had it quilted for me. I'm blessed to have a seamstress mother, and blessed to have quite a collection of quilts--both old and new. Love them all and the stories they tell. Yum Renee, I feel a little closer to God just looking at those fabrics;>) So gorgeous! What a perfectly lovely post. I just loved the words you used and the wonderful truth you expressed. Thank you so much! I feel the same way about fabrics....they soothe the soul! Your daughter looks so sweet under that quilt! What a beautiful fabric selection and handmade quilt. What a special treat for you to see your daughter comforted with your quilt that you had to have spent so many hours on!! Isn't it so wonderful that God blesses our hands with work to do that can turn out so beautifully! Renee, Thank you for wanting to comment on my blog! I know there is a spot under the post - a link to click to leave a comment. I'm not sure if you having a Google blog and me having a WordPress blog has anything to do with it. I know that when I post a comment to yours, I have to allow my OpenID account with Wordpress and validate my ID. Not many comforts can be better than a mother's quilt. That one looks so comfy!